This pack is a must for fans of our ragtag razzamadazzle ‘stone’ characters! All four ‘Stones’ products are available as a bundled resource. 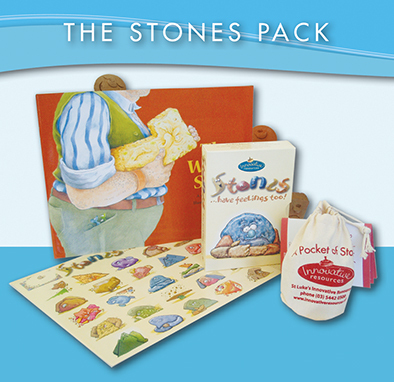 The kit includes the much-loved picture book The Wrong Stone, our ever-popular Stones …have feelings too! cards and stickers, and the Pocket of Stones which contains 12 hand-crafted, ceramic stone characters. This complete Stones pack, valued at $123.40, is being made available at the special price of $92.55. 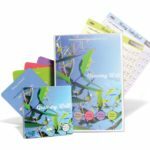 Together, these tools form a terrific resource for exploring feelings, body language and emotions. Teachers, counsellors and human service workers: here’s the ultimate line-up of stony-faced friends for building emotional intelligence and a feelings vocabulary! During September 2012, our collection of ‘stony’ resources inspired lots of fun and creativity at the Women’s and Children’s Hospital in Adelaide. Art therapist, Belinda Ryan, selected our picture book, The Wrong Stone, as her starting point for some ingenious workshop activities for siblings of children in the hospital’s Paediatric Palliative Care Unit. Children identify with the stony characters immediately, and there are so many ways you can play with stones!